TBI’s second Visiting Senior Scholar, Professor Simiyu Wandibba, has enjoyed a productive semester at Stony Brook University. Professor Simiyu Wandibba, TBI’s current Visiting Senior Scholar. Since January, Professor Wandibba, as well a member of the university’s research faculty in the Department of Anthropology, has worked on various projects, and conducted seminars and guest lectures, based out of the Institute’s headquarters in the university’s Social and Behavioral Sciences building. Dr. Wandibba is Professor of Anthropology at the University of Nairobi’s Institute of Anthropology, Gender, and African Studies, and former Head of the Division of Archaeology at the National Museums of Kenya. 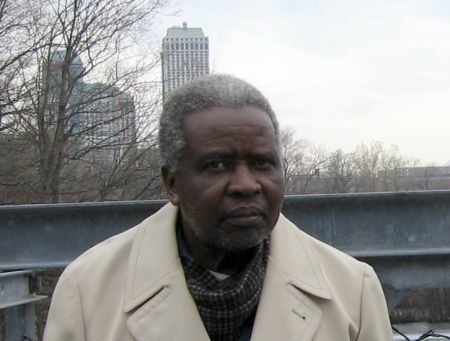 A prominent figure in African archaeology, his research interests are in the Holocene archaeology of eastern Africa with a special focus on ceramic ethnoarchaeology, the study of ethnographic pottery from an archaeological perspective. Wandibba feels his tenure at TBI has been professionally rewarding. “I’ve enjoyed the good facilities here,” he remarked. “I have been able to acquire materials for my classes back in Kenya.” He has found access to Stony Brook’s many e-journals to be particularly useful. Wandibba will be in the office of the Turkana Basin Institute until June. The TBI Visiting Senior Scholar program is designed to enrich TBI and Stony Brook University intellectually and to provide senior scholars working on project relevant to human evolution an opportunity to focus on their research in a stimulating intellectual environment away from the demands of their usual academic positions. It is intended to promote opportunities for students and faculty to collaborate on research projects and to exchange ideas. The position was previously held by Professor Paul Mellars of Cambridge University.